“Are there ways on how to make running easier?” This is the question you’re probably asking yourself as a beginner level runner. The short answer is yes. But there’s only one small caveat: you have to be consistent with your running in order for it to get easier. It’s common to start out struggling. I can’t think of a runner off the top of my head that started off with their share of struggles. Just remember that it takes time to build your body up to withstand cardiovascular fitness. 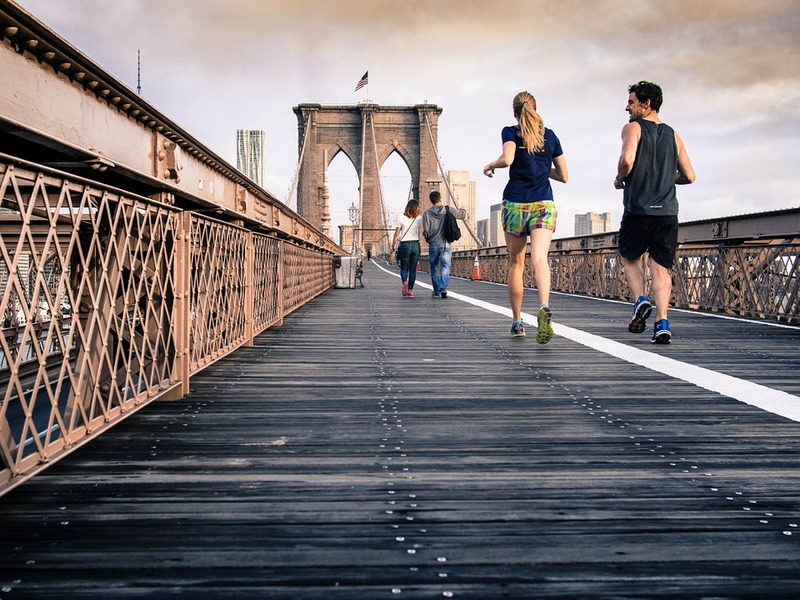 The more you do, the better your body can withstand running. Slow and steady is the pace: When you’re starting out, it’s unwise to go hard right out of the gate. Your pace throughout the entire should be slow and steady. If you need to whether or not your pace is good enough, try running at your chosen pace and talk in full sentences with a friend (if you’re running along, sing a song...way better than talking to yourself). Breathe Easy: Your breathing and your pace go hand in hand. If you’re running at a pace that leads you to being out of breath, you’ll need to change it in order to breathe easily. It’s important that you are breathing deep and heavy from your belly instead of shallow and from your chest. Start Easy: If you think it’s best to run a mile course in a hilly area of your neighborhood, you’d be making an unwise decision. That’s why when you start, find a place with a flat surface like a running track or bike paths. Even if you have to drive clear across town, you’d be better off instead of tackling the challenging terrain. 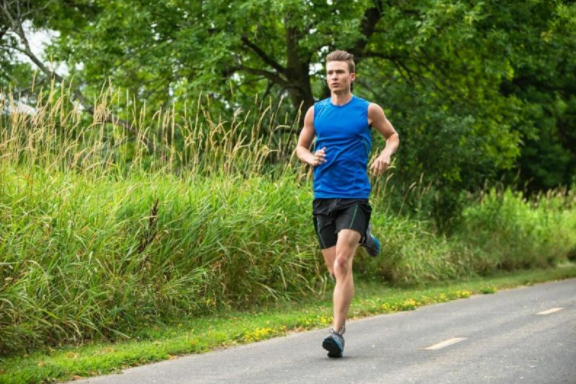 Maintain good posture: Your running form is something to keep in mind as your starting out. You don’t want to “slouch and run”. 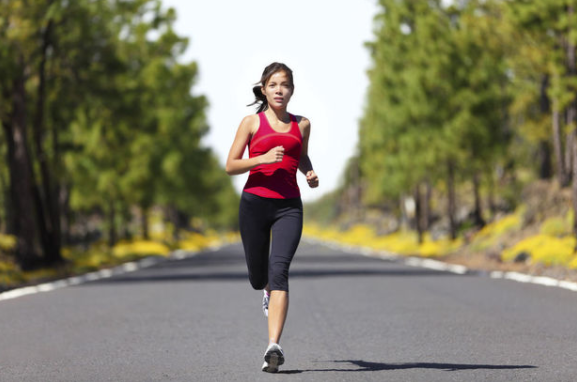 Slouching or leaning forward can hinder your breathing as you run, and in turn will leave you out of breath. Be sure to keep your shoulders back and practice good posture. Having stronger abs can help keep your shoulder back. If you need to strengthen your abs a bit then something as simple as sitting on one of balance chairs can do wonders. Don’t forget your arms: You should incorporate arm movements as you run. You do this by relaxing them at a 90 degree angle. Rotate your arms at your shoulders. Pull one arm back, the other forward and alternate repeatedly. Your arms will help your legs lighten the workload and keep you going. Start out small: If you’re goal is to cover as much ground as possible or increase your overall run time, set a goal. Then break it down into smaller goals so you can work towards it in small bites (or smaller intervals). This will prevent you from having running related injuries. So if you want to start out at 30 minutes, you can walk for a 7 minute interval, run for 3 minutes, do another 7 minute walk, etc. (until you reach the 30 minute mark, which should end with your third and final 3 minute run). As you go farther along, you can shorten the walk intervals and lengthen the runs. In this way, you are almost complete in learning the ways on how to make running easier. The “Mind” Game: The old adage of “90% mental and 10% physical” is no lie. Most beginner level runners are physically able to withstand running short or medium distances. Yet, when it comes to the mental aspect of running, their confidence and mental toughness falls short. Your physical and mental capabilities must work together in order for you to enjoy and incorporate running into your everyday life. Bear in mind that in the beginning, you might get a little sore. 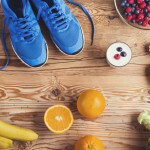 This is common as it is your body’s way of telling you that it is getting accustomed to the physical changes you’re putting it through by ways on how to make running easier. If you continue to experience pain that is more severe, you may want to notify your physician as it may be a sign of an aggravating injury.